After a morning at the Eugene Saturday Market and the Lane County Farmers’ Market, my sister and brother-in-law took me to a nice lunch at King Estate Winery. Oregon and Washington have many vineyards and wineries. The cool coastal lands favor the grapes that make Pinot Gris (aka Pinot Grigio) and Pinot Noir wines although vineyards in Eastern Washington State, where it’s much warmer, produce grapes that also make more full-bodied wines like Sangiovese and Cabernet Sauvignon among others. Entrance to King Estate Winery near Eugene, Oregon. 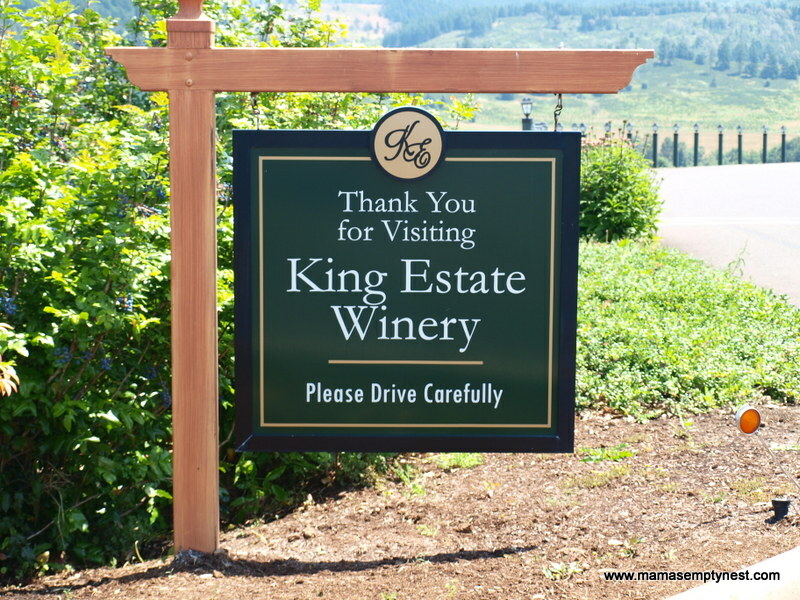 King Estate Winery was founded in 1991, and we first visited shortly after it opened. It is a much larger place today covering over 1,033 acres with many vineyards and orchards covering the rolling hillsides. King Estate is a Certified Organic winery (of course, it is in Oregon after all) and is known for its Pinot Gris and Pinot Noir wines. Wine flights – a great way to taste a variety of wines. My brother-in-law lined up the flights in front of me and called it my lunch. Yes, he’s a funny guy. We tasted a few different wines along with a nice lunch in their award-winning restaurant. My sister and brother-in-law are well versed in wines, and spent their honeymoon in the vineyards and wineries of the Loire Valley in France. I learn a lot from them when I visit. I also get to enjoy some really nice wine. The King Estate Winery sits on a hill overlooking the vineyards and orchards. The grounds surrounding the winery and estate buildings are gorgeous. The road leading up the hill to the winery is lined with beautiful, manicured foliage. 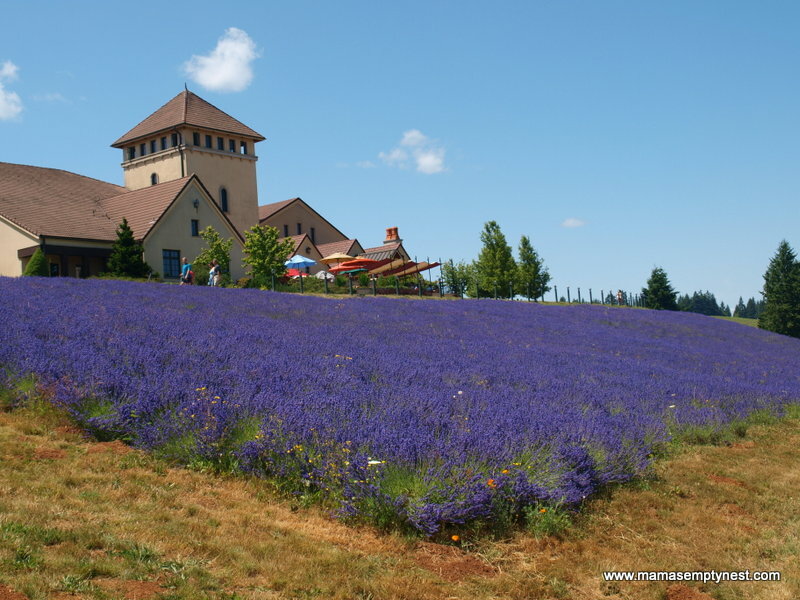 The purple flowers are Buena Vista lavender which is a variety of English lavender bred in Oregon. 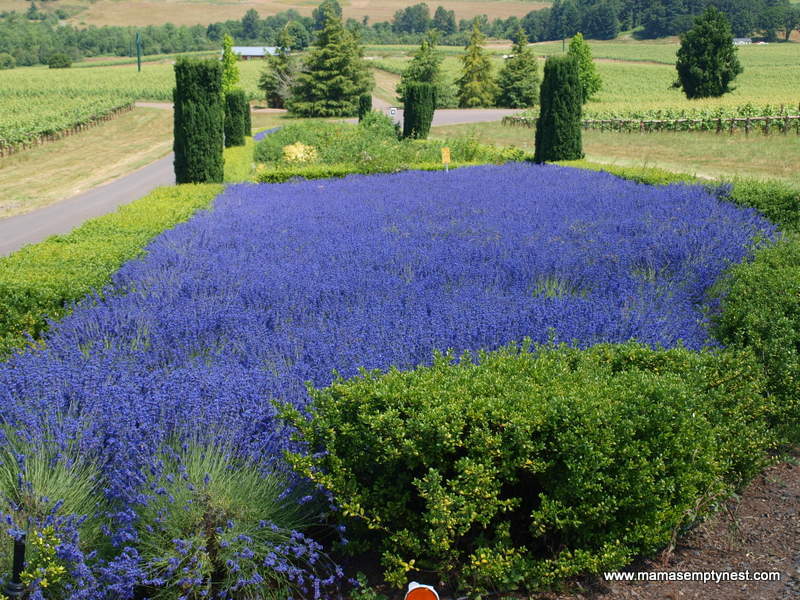 It has an unusually long flowering season when compared to other lavenders and blooms twice per season (late Spring and Fall). It can be used in cooking as well as for other uses like French lavenders. The King Estate buildings look like a manor estate like you might see in Europe. On our first trip to King Estate, we were able to tour the man-made caverns where the wine is aged in oak barrels. At the time, and probably still, the concrete structure was the largest continuous concrete pour ever conducted in the State. Labels, other than King Estate, produced by the winery include Domaine, Signature, Acrobat by King Estate, NxNW (North by Northwest), and Lorane Valley. DSH and I enjoyed our first bottle of King Estate wine during a romantic dinner at a wonderful, waterfront restaurant in Portland, and it has remained a favorite of ours ever since. I enjoyed the wine, food, and special time away from the kids with my sister and brother-in-law. Wine, like food, is enhanced by sharing with those you love.